Happy Funny Kid Friday and Five for Friday! Laughs and tips and pics of the room ahead! 1. I have more than a month before kids come back to school here in Michigan, but my mind wanders toward the classroom more and more. I'm thinking room set-up today– some things to keep from last year, some things to tweak. 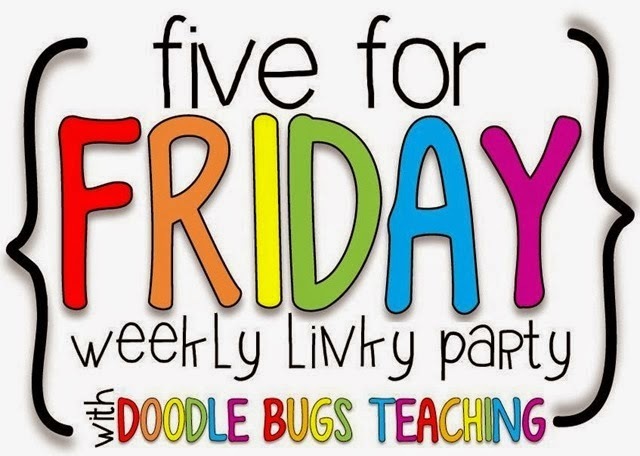 This week's Funny Kid Friday story came to mind as I thought about my classroom. "Please, God, give us more room in the coat hall." Her mom said she almost lost it right there in the middle of the prayer, and it's a good thing I was out of sight of the kids when she told me, because tears were running down my face. I guess our little miss learned at an early age that you take all problems right to the top Man! Don't forget to link up your funny kid story below! 2. There are certain nooks of my classroom that I really like... like my coat hall, even if it could be a bit bigger. Here is a photo of another area that I love. 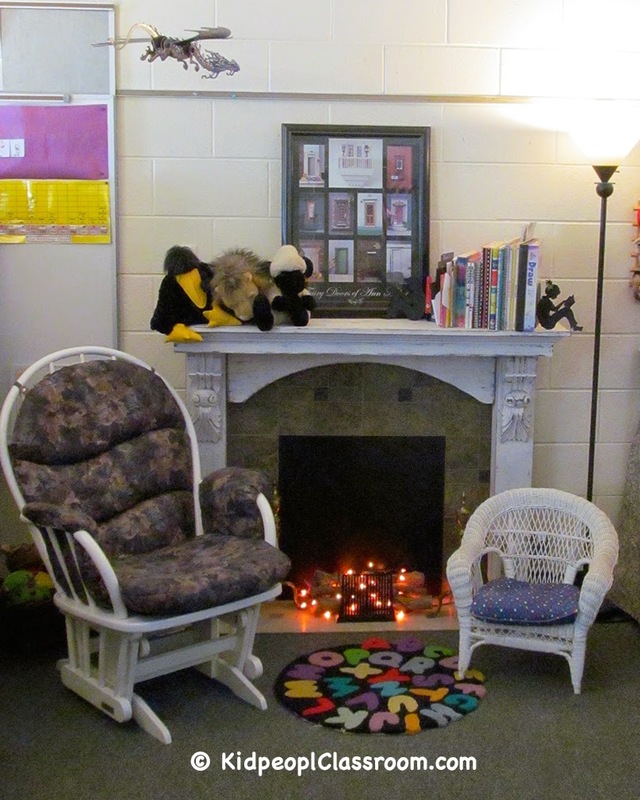 Jonathan installed a "fireplace" for me in the classroom library! When I moved to the school that I'm at now, we went on the hunt for a mantle that would fit and we could afford, which was not easy. When we finally found it, Mr. J put a facade in the middle opening, using floor tiles and black foamcore. I arranged some logs, LED twinkle lights for embers, and an old bookend for a grate. I plug it in every morning and the kids love to gather in the chairs or on the floor in front, usually with books. This spot gets a lot of attention from visitors who love the welcome feeling, to which I reply, "It is my second home!" 3. Another nook in the room is over in my block area, where my wooden block animals live. These zoo animals have chunky dimensions that go with classic unit blocks. They are pretty classic themselves. I like them so much I wanted storage that would show them off, entice the kiddos to use them, and provide easy access all at once, and I think I found it. I used two by twos, painted the same color as the wall, to make perfect custom shelves. 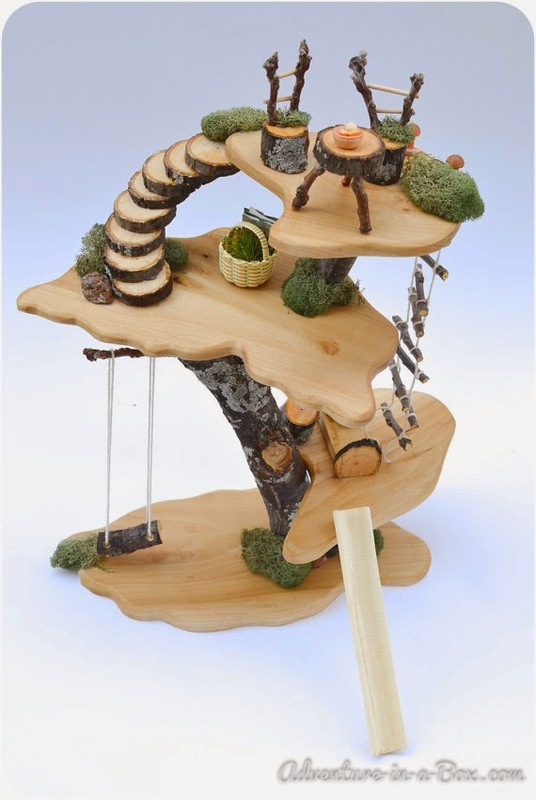 The animals became decor, as well as building accessories. 4. When thinking about pretty much anything for my room, from toys to storage, I think first think Garage Sale, Baby! I know there are people out there– surely not teachers– but other people who would never go to garage sales. I am here to tell you that those people are missing out, because from these humble sources I've found some of my best treasures. One example is those fine wooden animals I show off up there in number three. When I asked the lovely woman how much she was selling them for, she answered "five dollars." I truly thought she meant five dollars each, and although that is a good price, I debated a couple minutes, wondering if I needed all of them. When she realized what I was thinking, she said, "No, five dollars for the whole set..." then she went digging in the box and found four more to add to the four in my hands! All EIGHT for FIVE DOLLARS!!!!! Man, I was doing the HAPPY dance. It was THE find of last summer. WHOOT! And THIS summer, Jonathan and I pulled up at a garage sale and before the car was even fully stopped I was up the driveway and claiming this! This photo is not of the one I got at the garage sale, as I already broke it down and hauled it to school, but mine is just like this one sold on Etsy, except my particular one has more accessories and another level. Beautiful, right? I looked at them many times, but this one is over two hundred dollars. What did I pay at the garage sale, you ask? TEN BUCKS. I was doing the happy dance so much this time I almost peed my pants. I can hardly wait until this is set up in my classroom and kids are playing with it. So although there is no guarantee that you are always going to find booty when you go out "sale-ing," you're never going to find treasure if you don't at least drift by those garage sales and skim over the wares. I HIGHLY recommend it! Look for me on Saturday mornings! 5. Okay, it is late Thursday night as I write this and I really gotta get to bed... so because Five for Friday is supposed to be about random things, I'm just going to say I'll have a little surprise for Made It Monday, and you are gonna want to stop by then. Jonathan and I have been very busy on a special project which I bet you find inspirational. Thanks, as always, to Doodle Bugs for Five for Friday! Click the button to find more great ideas. 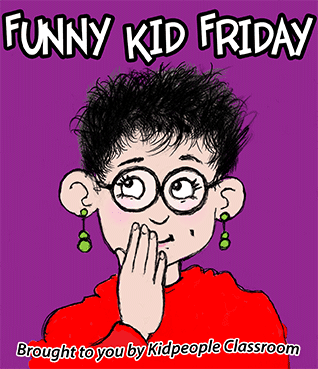 AND I hope you'll grab my Funny Kid Friday linky button here and then link up below to share YOUR funny kid story. Do YOU have a coat hall??? I adore your fireplace, and I so wish I had more room. I had to leave my classroom tree behind at my old school because there was no extra space where I moved. BUT, I do think a faux campfire could be in the works for the kids to gather around... :0) Thanks so much for sharing so many goodies this week! I LOVE your classroom nook!!!!!! That looks so cozy!!!!!!!!!!!! Our school won't let us have holiday lights. :( Your blog is so cute! I'm a new follower! Thanks, Lori. I tried to find your email on your site to give you some info on lights, but was unsuccessful. Thanks for follow... me, too, with you. I love your room! So cute and fun! I’m gearing up for a big giveaway on my blog on August 11 - come stop by so you don’t miss it!! Glad you like it, Sarah. I'll check out the giveaway!